Yesterday the CD had its world premiere at the UFO convention, SHADO Con 2, and now it’s the turn of all other Fanderson members to get their hands on this stunning release. 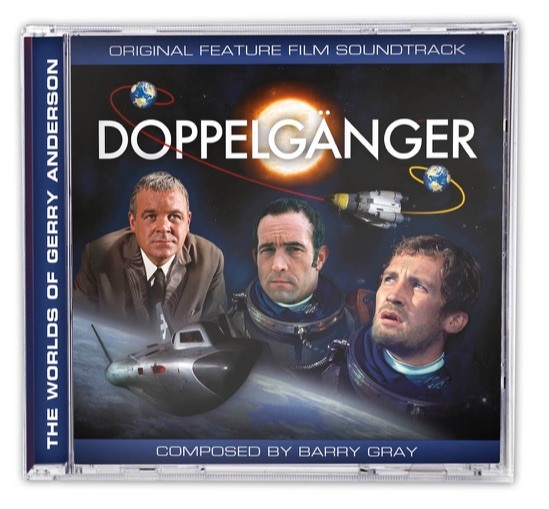 The 77-minute CD album contains Barry Gray’s complete stereo score for Doppelgänger (AKA Journey To The Far Side Of The Sun), performed by a 55-piece orchestra with Sylvette Allart on the Ondes Martenot. Composed and recorded for an initial edit of the film, including scenes that were ultimately trimmed from the final cut, it includes cues composed for those scenes that have never been heard before outside the studio. This is accompanied by a corresponding assembly of mono cues, arranged exactly as heard on screen. A bonus track included is Threnody For The Victims Of Hiroshima by Krzysztof Penderecki, a short section of which replaced part of Gray’s composition in the final edit of the film – the only piece of library music used. This latest addition to the critically-acclaimed Fanderson soundtrack library is completed by a 20-page full colour booklet. Fanderson members had their first chance be able to buy their Doppelgänger soundtrack at SHADO Con 2, which took place on Saturday 30th June 2018 at Quad, Derby. You can find out more details of the event here. It now goes on sale from the club website today - 1st July 2018 – the 50th anniversary of the start of principal photography on the feature film. The Doppelgänger soundtrack is a limited edition release and, like all of Fanderson’s merchandise, is available exclusively to Fanderson club members. Take a look at Fanderson’s library of amazing soundtrack albums.